As a child, Fabiana Arias-Pinto never considered engineering as a possible career, but when she was looking into college majors she soon found that Venezuela had an oil-dependent economy. This meant the oil industry was booming and filled with opportunity for the incoming work force. Fabiana knew she wanted more opportunities in her professional career, so she decided to pursue chemical engineering for her undergraduate degree. 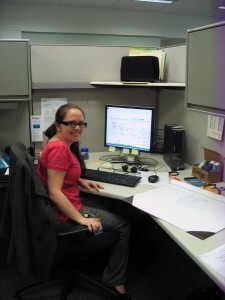 For one year, Fabiana worked in Venezuela as a process engineer at a consulting company. In 2014, she made the life-changing decision to move to the United States to pursue a graduate degree at the University of Pittsburgh. As her college career was coming to an end, Fabiana found Kennametal online while looking for opportunities to network and broaden her experience through an internship. She chose Kennametal because she knew having experience with heat and material balances, energy balances, and process engineering in a large company was important as she began her career as an engineer. At Kennametal, Fabiana works in the Process Carbide Group where she researches the processing, pressing, and recycling of tungsten powder. 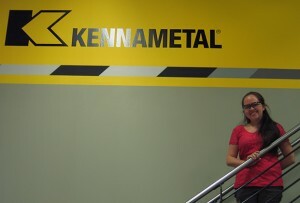 Fabiana works directly with some of Kennametal’s plants to optimize the usage of the tungsten material that is used to make Kennametal tooling. Fabiana began her internship by creating a model of the tungsten lifecycle for the Technology Center at Kennametal’s Latrobe campus. Based on her success in Latrobe, Fabiana has had the unique opportunity to visit many of Kennametal’s plants to create large-scale custom models for these production facilities. 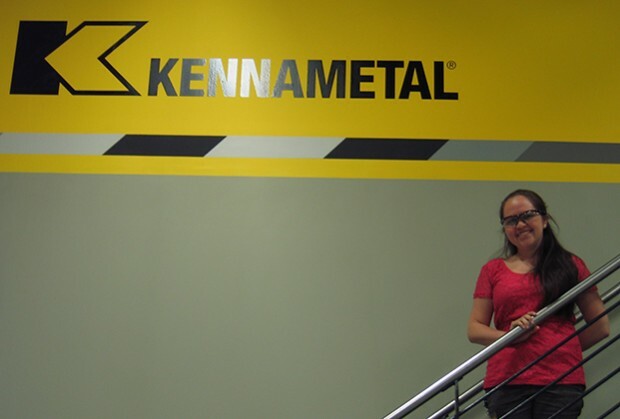 During her visit to each Kennametal facility, Fabiana works to establish a contact within the plant, explain her project, and review the current production processes and any data that the plant is currently collecting. She then works to create a new model, which serves as a recommendation to each plant manager to help optimize their tungsten usage. Fabiana will complete her Masters in Petroleum Engineering in August. In the future, she hopes to continue her career at Kennametal. “The people at Kennametal are always willing to help and are invested in my development. The company, its products, processes, and focus on efficiency are fascinating.” She loves that employees are always looking to improve process efficiency and that she can see her work in action across North America.